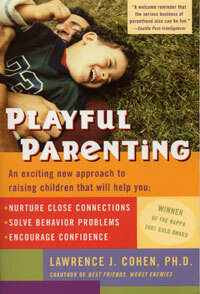 The giveaway to win your own copy of Playful Parenting, valued at $19, ends today, January 29. Dr. Larry Cohen's #1 parenting book, Playful Parenting, shows how play is the way children communicate, and it's the way we as parents can meet them where they are — to work through strong emotions, explore vulnerabilities safely, and ease tough transitions and behavioral issues. A big congratulations to the winner of the Picaboo Premium Photo Calendar giveaway — #166! Picaboo photo calendar giveaway ends tomorrow! Remember — you have one day left to enter to win a free Premium calendar from Picaboo ! Contest is open internationally and ends Tuesday night, January 25, at 11:59 p.m.
Dr. Larry Cohen is offering readers at Natural Parents Network a giveaway of a copy of the #1 parenting book Playful Parenting ! Play is the way children communicate, and it's the way we as parents can meet them where they are — to work through strong emotions, explore vulnerabilities safely, and ease tough transitions and behavioral issues. "Playful Parenting is my personal favorite parenting book. Dr. Cohen focuses on establishing trusting connections between parents and children, rethinking the way we discipline, and empowering and believing in our children. But even better than the lessons in a positive parenting philosophy, he offers concrete examples of how to implement play in your everyday parenting. Dr. Cohen explains why and how parents playing with children can not only promote closeness and confidence, but it can ease discipline challenges and sibling rivalry." When I read it, I was very impressed with Playful Parenting and its message of respecting children by getting down on the floor to play. Check out, for example, "Follow a child's lead in play" and "Rainy-day movement ideas for toddlers." I know you'll enjoy entering for a copy of the paperback book or the audio book on CD! So head on over by this Saturday, January 29 to enter to win your own copy of Playful Parenting, valued at $19. Contest is open to U.S. and Canada. Disclosure: Amazon links are affiliate. I coordinate giveaways at Natural Parents Network. but our reviewer received a book to read. relevant and useful to your life as a natural parent. If I don't like a product, I won't be recommending it to you. Photo books & calendars — buy one, get one free at Picaboo! Buy one Classic photo book or any calendar, get a copy free, January 17 through January 31 at Picaboo. Use code BGFCBC. See my review of the Classic photo book here. Either item would make a heartwarming gift for a loved one, or become a sentimental favorite in your own home. Get a calendar shipped by February 1 to ensure Valentine's delivery! Buy any qualifying product(s) and get one of the exact same product(s) for free when the coupon is applied (for example, order one Large Classic book, get a copy of the same Large Classic book for free). The cost of the free book(s) or calendar(s), including extra pages, will be deducted from your order total. The discount does not apply to taxes or shipping fees. Coupon does not apply to additional shipping costs for the free book(s) or calendar(s). Coupon expires January 31, 2011 at 11:59 PM (Pacific Time). Cannot be combined with any other coupon or offer. And if that's not enough for you, enter to win a free Premium calendar! Contest is open internationally and ends Tuesday, January 25. Disclosure: Picaboo links are affiliate links. Valentine's cards 50% off at Amy Adele! Say "I love you" in style, with Amy Adele's adorable, custom Valentine's Day cards. The deal has been increased, from 30% off originally — now 50% off! 50% off custom Valentines at AmyAdele.com! Offer good through January 31. Plan your love letters from Amy Adele today! Perfect for class Valentine's Day card exchanges at school, or sending to beloved family and friends! Disclosure: Amy Adele links are affiliate links. Extra 25% off Tea Collection sale items for 3 days only! The super semi-annual sale at Tea Collection, which already offers savings up to 50% off, is about to become even sweeter! For three days only, Tea Collection is offering an additional 25% off all sale items with promo code 25SALE. Tea Collection is known for globally inspired clothing for children and women. Now's the time to enjoy an extra 25% off sale items, including dresses, pants, shirts, and more — for babies, girls, boys, and women! Just enter code 25SALE at checkout starting today, Monday, January 17, through Wednesday, January 19, at 11:59 p.m. Pacific Time to receive this additional savings of 25% off sale prices. This super sale is for three days only, so check it out today! Disclosure: Tea Collection links are affiliate links. 50% off at Amy Adele for thank-you cards EXTENDED! The sale on thank-you cards at Amy Adele has been extended — through tomorrow, January 16! Say thank you in style this season! from Amyadele.com. Ends Jan 16. 30% off custom Valentines at AmyAdele.com! Offer good Jan 17 thru Jan 31! Plan your love letters from AmyAdele.com today! 40% off winter clearance at Umi Shoes! There are some great deals at Umi Children's Shoes! At Umi, caring for little feet also means caring for the earth — which means we set our standards sky-high. Every shoe we make is tested for safety and durability and meets strict guidelines for child-safe materials. We use only non-toxic drum-dyed leathers and other environmentally friendly components. Protected in recycled packaging, Umi’s a brand sure to please parents and Mother Nature alike." You can find quality, hand-crafted shoes for children age 1 through 8 years. Take 40% off Winter Clearance at UmiShoes.com! Save 10% off your order at UmiShoes.com! Get Free Shipping on Orders over $50 at UmiShoes.com! Umi Shoes. A little love for little feet. Disclosure: Umi Shoes links are affiliate links. Modest Middles is offering readers at Natural Parents Network a giveaway of a Modest Middles nursing tank top, perfect for comfortably breastfeeding in public while still wearing your favorite nursing bra! Amy Maschue, a wife and mother of five young children, started Modest Middles because she couldn't "find a nursing shirt that looked good and kept me covered, while allowing me to easily access the nursing bra of my choice. I couldn't find it so I designed what I needed." How it works: You put on your favorite nursing bra, then put on your Modest Middle, then put any shirt on top. I wrote about Modest Middles when I first discovered it — I thought it looked perfect for those of us who want to wear our own, supportive nursing bras (or no bra!) but fear that a typical nursing tank, with a shelf bra or similar support, would then make things too bulky. Besides, I figured with my advanced cup size that I would never find a nursing tank that fit right, anyway! Modest Middles sponsored a review for us over at Natural Parents Network, and Amy of Anktangle graciously complied to test out the tank top, with glowing results. So head on over by tomorrow night — Friday, January 14 — to enter to win your own Modest Middles nursing tank top, valued at $29.99. Contest is open to U.S. addresses. Disclosure: I coordinate giveaways at Natural Parents Network. but our reviewer received a nursing tank to try out. This giveaway is now closed. View the winner announcement here. Thank you all so much for entering! This is a joint giveaway with Hobo Mama Reviews and Natural Parents Network. You may enter at one site only. Please find the section marked "Win it!" for the mandatory main entry and optional bonus entries. Picaboo is offering my readers a giveaway of an 11 x 14-inch Premium Calendar! 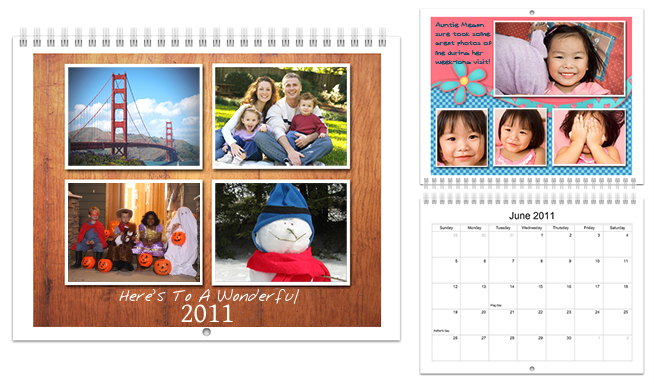 Picaboo offers customized photo books, cards, and calendars. One lucky winner will receive a coupon for a free 12-page glossy photo calendar, valued at $29.99. With more than 40 themes and hundreds of backgrounds to choose from, and the ability to create your own from scratch, Picaboo makes it easy and fun to create gorgeous calendars that will make it hard to resist flipping to the next month. Photo pages are completely customizable with Picaboo's easy-to-use software, allowing you to drag-and-drop photos and captions anywhere on a page. Picaboo recently added editable calendar grids, which allow you to personalize special dates with important occasions like birthdays, anniversaries, or any other event you want to be sure to remember! The Premium calendar features 12 laminated, glossy photo pages that give your pictures a little extra pop, and matte date pages allow for easy writing. 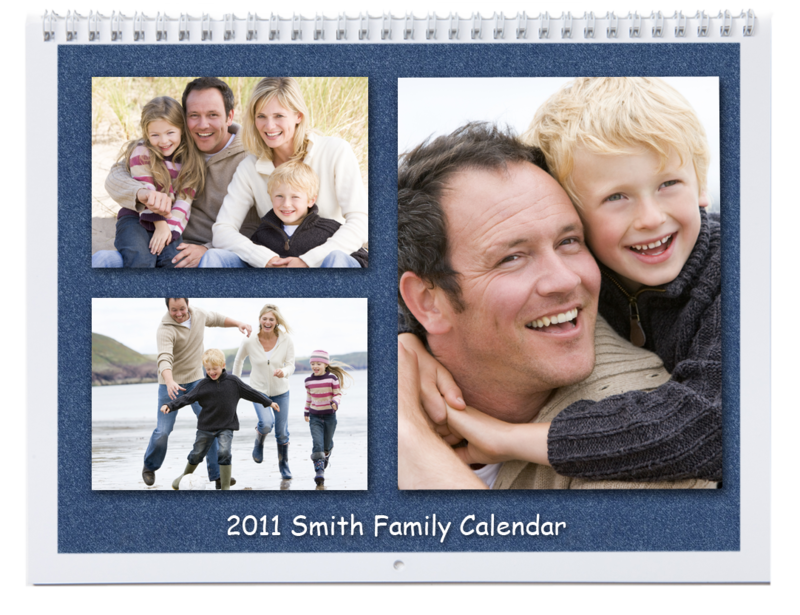 Use photos from 2010 to create the perfect gift that is enjoyed every day of 2011! This coupon is good for one 12-month Premium Photo Calendar. It does NOT cover applicable shipping costs. Shipping within the United States starts at $5.99 for USPS Priority Mail. The coupon will expire on February 15, 2011. This could be a great Valentine’s Day gift for a friend or loved one! Order by Monday, February 1, to ensure delivery by Valentine’s Day with standard shipping (within the continental U.S.). Picaboo currently ships to these listed countries. Please verify shipping price and availability before entering if you require international shipping. This giveaway is limited to one per person globally, so the same person cannot win the giveaway on more than one site. You're free to enter Picaboo giveaways on multiple sites, but be aware that you can win only one calendar, and a new name will be drawn if the selected winner has already won elsewhere. I love the idea of making a calendar as a loving and beloved gift for grandparents! Friends of ours make a photo calendar every year for themselves and their family members, placing in thematic photos of their adorable girl for each month — playing in the snow for January, giving a hug for February, romping in flowers for May, visiting the beach for August, and so forth. Each year's calendar is a huge hit, showcasing some of the best photos from the previous year so they can be enjoyed throughout the next one! And, after the year is over, it remains a priceless keepsake. Another great idea would be to highlight your favorite vacation photos, family photos, nature photos, or perhaps just your favorite photos in general. If you're giving it to a sweetheart, it could be 12 cuddly photos of the two of you! We're ending this giveaway a little bit sooner than we normally would so that if you win, you have time to get your calendar shipped by Valentine's Day if you like. Remember, the ground shipping cutoff for Valentine's Day delivery to the continental U.S. is February 1. Get 20% off any fully customizable photo calendar or photo book plus free U.S. shipping with code HNY20FS. Expires January 17. Buy one Classic photo book or calendar, get a copy free, January 17 through January 31 at Picaboo. Use code BGFCBC. Classic Calendars are 8.5 x 11 inches and feature matte photo and date pages for $19.99. Premium Calendars are 11 x 14 inches and feature glossy photo pages with matte date pages for $29.99. Shipping starts at $5.99 for Priority Mail shipping to the U.S.
For your own chance to win a Premium Calendar from Picaboo, enter in the comments below! Contest is open internationally (more specifically, to any countries to which Picaboo ships), but winner pays all applicable shipping costs. Visit Picaboo and tell me what sorts of pictures you'll put into your calendar if you win! This is a joint giveaway with Hobo Mama Reviews and Natural Parents Network, a new site co-founded by Lauren of Hobo Mama & Dionna of Code Name: Mama and intending to bring together those interested in attachment parenting and a natural lifestyle. You may enter at one site only, and we'll be recording IP addresses to ensure that there are no duplicate entries. That said, please do check out and enjoy both sites! Visit Picaboo and tell me what your favorite product is besides the Premium Calendar. Follow www.HoboMamaReviews.com publicly through Google Friend Connect, or subscribe to the Hobo Mama Reviews RSS feed in a reader or by email (1 entry for each). Follow www.HoboMama.com through Google Friend Connect, or subscribe to the Hobo Mama RSS feed in a reader or by email (1 entry for each). Subscribe to Natural Parents Network in a reader or by email. Follow @PicabooBooks on Twitter and leave your Twitter name in the comment. Follow @Hobo_Mama on Twitter and leave your Twitter name in the comment. Follow @NatParNet on Twitter and leave your Twitter name in the comment. 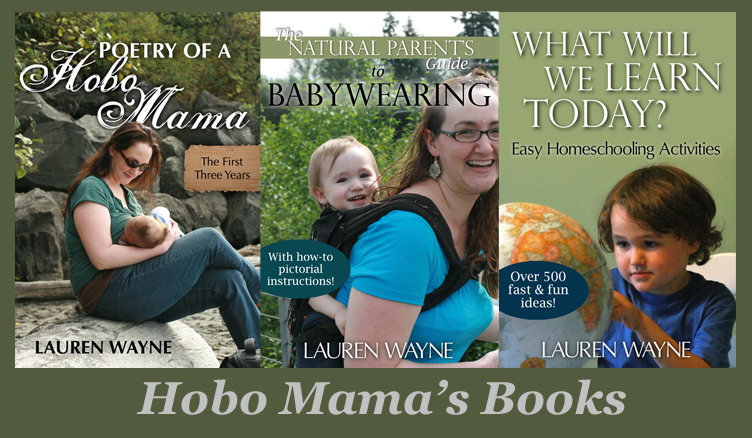 Like Hobo Mama on Facebook. Like Natural Parents Network on Facebook. Enter another of my current giveaways or the giveaways on Natural Parents Network (1 extra entry per giveaway — check back for more). Put my Hobo Mama button on your website or add http://www.HoboMama.com to your text blogroll for 2 extra entries each. The HTML code for the button is in the sidebar. Leave your site URL in the comment. Put the Natural Parents Network badge on your website or add http://NaturalParentsNetwork.com to your text blogroll for 2 extra entries each. The HTML code for the badge is on the front page of NaturalParentsNetwork.com. Leave your site URL in the comment. Contest open internationally. Picaboo currently ships to these listed countries. Please verify availability and shipping costs before entering if you require international shipping. Winner is responsible for applicable shipping costs. Contestants may enter at either Hobo Mama Reviews or Natural Parents Network but not both. Entries will be combined for the drawing of a single winner. Leave each entry as a separate comment so I can count them all. For actions like following and subscribing, if you already follow or subscribe, just let me know in your comment. For tasks that garner you multiple entries, you can copy and paste the comment with a #1, #2, etc. You don't have to do any of the bonus entries, but you do have to complete the first mandatory one. I will pick the winner through Random.org after the contest closes and send an email notification. Leave an email address in your comment if it's not clearly visible on your profile or linked web page so I can contact you if you win. If I can't reach a winner or don't hear back within a couple days, I'll draw a new name. A winner can win only one Picaboo calendar, so I will verify your name with Picaboo before emailing you. If necessary, I will draw a new winner. Contest closes January 25 at 11:59 p.m. PST. I did not receive any compensation or product for review. How to buy a perfect car without overpaying? Fight Cancer with Salad at Piada Italian Street Food Restaurants!